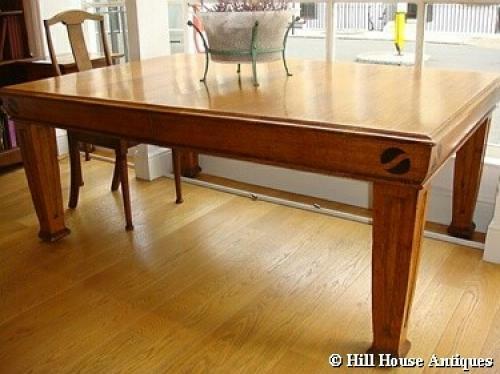 Superb quality large oak Arts & Crafts wind-out dining table by A Isherwood; signed and dated 1904 to underside. Yin Yang inset inlaid ebony to each corner. When closed, can seat anything from 6 to 10 (if two at each end) diners. When extended, can easily seat up to 12 (possibly 14 if two at each end, all depends on the overall size of chairs). NB: First image shows table closed and measures a generous 6ft by 4ft as such; 9ft by 4ft when extended to include the two extra leaves of 1.5ft width each.